Opened 9.8.1884 West Drayton - Colnbrook; 2.11.1885 Colnbrook - Staines West. Closed to goods - 27.1.1981 Colnbrook - Staines West New Spur Jn. - Staines r/n 1949 Staines West. The town of Staines, 19 miles SW of central London, was in Middlesex until 1974 but is now in Surrey close to the Gtr London boundary. Independently promoted the Staines & West Drayton Railway (S&WDR) it reached Staines in 1885 and was absorbed by the GWR in 1900. 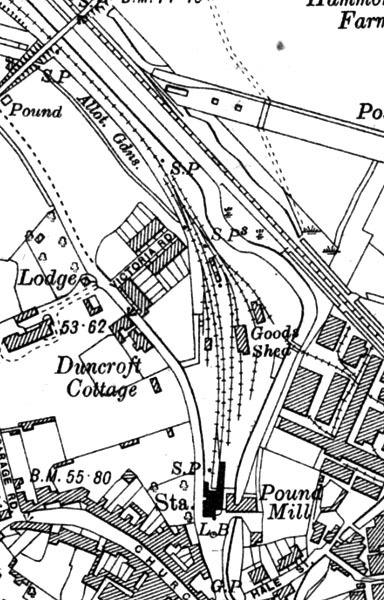 The original plans had envisaged linking it into the Windsor lines on Staines Moor but the L&SWR would not agree so it was carried over its lines to terminate alongside Pound Mill in Moor Lane. Because finances were tight the struggling S&WDR bought a mill owner's house adjacent to the site and altered it to serve as a station. In 1964 the Western Region provided 14 trains on weekdays the journey with four stops taking 17 mins; the following year the service was withdrawn. After closure to passengers the goods yard at Staines West was demolished and a rail accessed oil storage depot built in its place. When the line was severed by the building of the M25 in 1981, a new connection with the Southern Region line was made to serve the oil depot but ten years later it closed. The three miles between West Drayton and Colnbrook remain open as a means of getting stone, steel and construction materials to Heathrow Airport for the terminal 5 project due for completion in 2008. The bay platform at the west end of West Drayton station (GR061801) was used by both Uxbridge and Staines branch trains with both branches diverging NW from the Paddington - Reading line immediately west of the station. The two branches then parted company after a short distance with this line turning south to pass under the main line and bridge the River Colne. From there it headed SW passing under the later M4, the A4 at Colnbrook Estate Halt and at Colnbrook over Bath Road by means of a level crossing. Poyle for Stanwell Moor Halt was located on the south side of the Horton Road overbridge and for the next two miles it ran south alongside the Wraysbury River. It then climbed away from Yeoveney, bridged the L&SW Windsor branch, passed under the Staines Bypass (A30) and ended at Staines West station (GR032718) near the junction of Wraysbury Road and Moor Lane. The operational part of the branch currently ends at the site of Colnbrook station (GR036767) in Bath Road and since April 2004 rails across the Bath Road have disappeared under a thick layer of tar. From there it is walkable south to Horton Road where, in 2003, there was a work site for an M25 spur. The trackbed continues on the opposite side of Horton Road and ends abruptly at the M25. 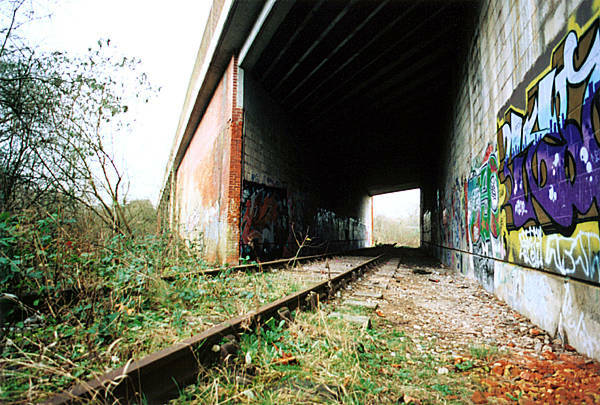 For 320 yards, the trackbed is lost under the M25 but a pedestrian underpass under J14 gives access to a tarmac bridleway that the route of the line joins. 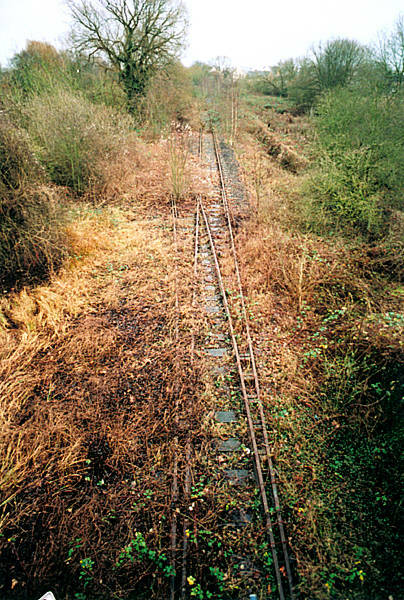 The trackbed stops at the dismantled bridge over the existing LSWR line. A pedestrian crossing over the line slightly further west leads to Moor Lane which leads to Staines West station. Overgrown tracks that served the oil depot at Staines are still in place. - Yeoveney - Wooden entrance gate and concrete supports remain. - Staines West station building intact listed grade ll, a section of platform track and buffer stop remain, platform area now a car park. cattle bridge over line south of A30 in place. Loco sheds - Staines (GR033720) on west side of line at north end of Staines West station demolished 1955, site now a timber yard. 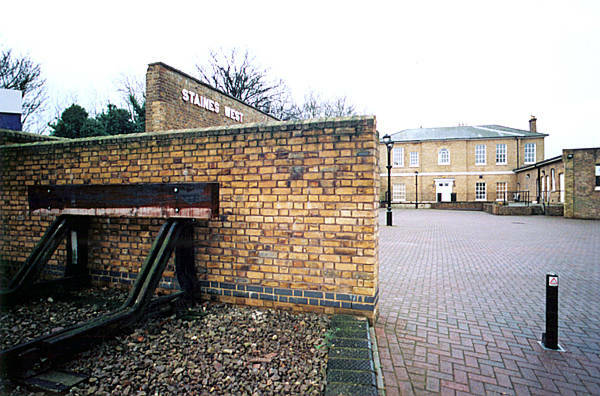 The Staines West station building. 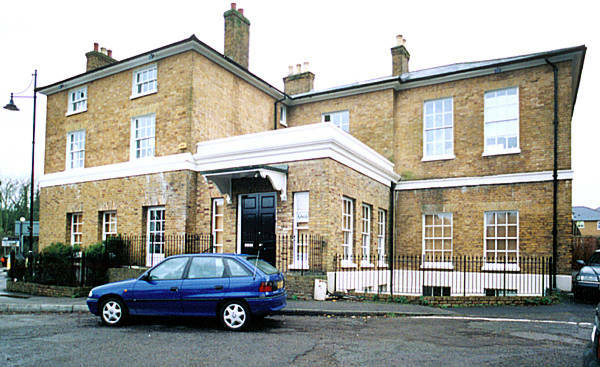 It wasn't designed as such; it was a Georgian house purchased by the Staines & West Drayton Railway as a cost cutting measure. It stands near the junction of Wraysbury Road and Moor Lane. The station forecourt and the station looking resplendent in the sun. Interesting that this was originally a house, then a railway station, and is now offices. The view at the rear of the station building looking north. Photographer Mike Matthews has included his young son Paul looking wistfully at the remains of the station - it adds an even greater air of melancholy and reflection to the photograph. The large retaining wall behind the canopy on the right hand platform, still exists today (there was also a left hand platform but it was more of a stub, probably to assist disembarking engine drivers). The view looking back at the station building. The right hand track up to the concourse has been removed; it was in situ in June 1977, so this photo post-dates that. The area where the photographer is standing is now lost under a housing development. 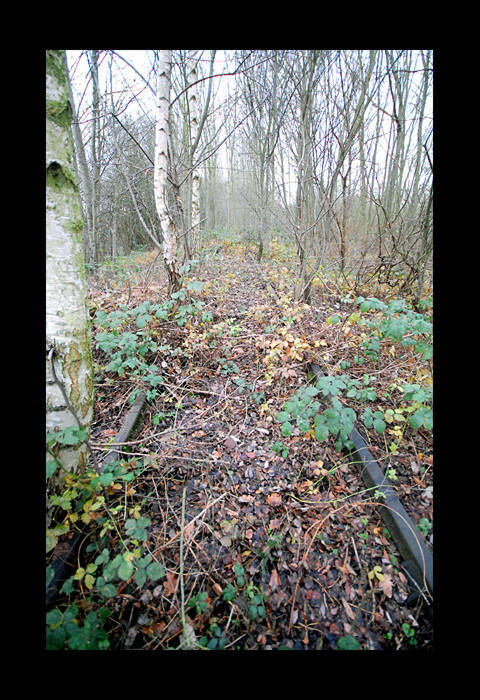 The area of the platform where the canopy was, still remains (see below). The passenger platform was here, running left to right, up against the large retaining wall. The station building is to the right. There was a canopy over the platform; one of its iron supporting posts is seen here, in use as a lamp, although it has been rotated 90°. A less subtle reminder of its former use. This view is of approximately one-quarter of the platform length. The remaining area of the platform, behind the photographer, is lost under a housing development. The rear of the old station building, now used as a car park. The rails laid into the paving are a welcome nod to the area's former use, although they are laid where the platform used to be. The large retaining wall on the left used to support the platform canopy. The platform height was approximately 15 inches higher than the paving on the left, although once it reached the concourse, it dipped down to the level of the station building. The location of the dip can be seen between the different heights of the two brick belt courses toward the bottom of the wall. An Ordinance Survey map from 1932 showing Staines West station. The goods area is notable, as is the Southern Region line running parallel with the Staines West branch north of the station. After closure to passengers, the goods yard at Staines West was demolished and a rail-accessed oil storage depot built in its place. When the line was severed by the building of the M25 in 1981, a new connection with the Southern Region line was made to serve the oil depot, although this closed ten years later. This northward view shows the existing Southern Regions line on the right and the remains of the connection with the Staines West branch veering away from it. This is north of the Staines West station site but before the line reaches the A30 road. The Southern Region link side by side with the Staines West track. Southward view from the bridge on Moor Lane: the left hand track seen here is the connection from the Southern Railways line; the right hand track leads to the oil depot and the Staines West station site. This area was so overgrown in early 2015 that the tracks were barely visible. Under the Staines bypass road (the A30) facing north, heading away from Staines. The quality of the graffiti on the left is high but if hadn't featured here, who would ever see it? Facing back the other way, toward Staines. Some remaining rails rusting just north/west of the above photo, looking northwards.